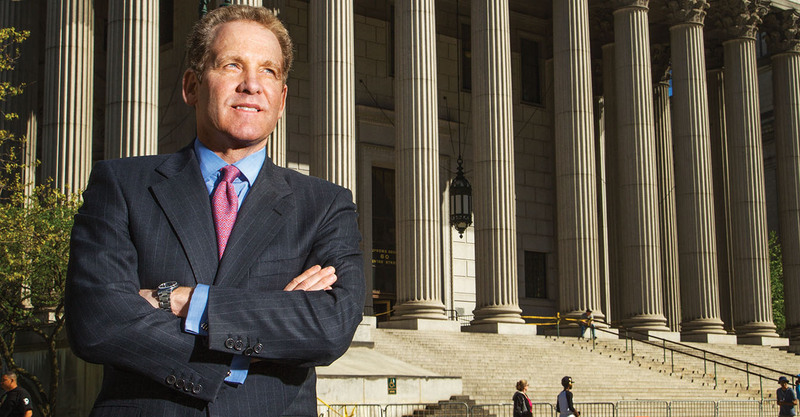 As the son and sibling of lawyers, Robert Giuffra may have been born to be in the profession. But you still need to get results to stand out at one of the nation’s most prominent firms, Sullivan & Cromwell, and earn a perennial spot in our elite Lawdragon 500 guides. Many of the world’s leading financial institutions and other corporate clients call on the New York-based partner for their most important cases; he also has achieved great results for individuals caught up in tricky disputes. Like many of the best litigators, Giuffra excels in the courtroom and also in convincing prosecutors and regulators not to charge clients facing white-collar investigations. Giuffra went to Princeton for his undergraduate degree and received his J.D. from Yale Law School in 1987, after which he clerked for 2nd U.S. Circuit Court of Appeals Judge Ralph Winter and U.S. Supreme Court Chief Justice William Rehnquist. He has been with Sullivan since 1989, though he has done multiple stints in the federal government, serving in all three branches. Lawdragon: Do you recall when exactly or why you wanted to become a litigator with the type of practice you have? Was there a course or professor in law school that was particularly important in this decision? Robert Guiffra: My father is a litigator. Even in his 80s, he still goes to work. Growing up, I watched him try cases. Around the dinner table, he told us exciting stories about his opponents and clients. It certainly made an impression. My younger brother and I are both trial lawyers, and one of my sisters is a lawyer, so we all went into the family business. At Yale Law School, I enjoyed corporate and securities law more than some of the more theoretical courses in the curriculum. My two years of clerking – particularly watching lawyers argue cases – convinced me that my future was in the courtroom. I’ve never really wanted to do anything else, other than to play on the PGA Tour, but I wasn’t a good enough golfer. LD: Can you talk a bit about what it was like to clerk for Chief Justice William Rehnquist? Can you share something that you learned from him or took away from your experience that has been instrumental in your success over the years? RG: The Chief was brilliant. He also was incredibly down to earth. Clerking for him taught me how to persuade a really smart judge. Over the course of a year, I watched him decide more than 100 cases involving some of the most difficult issues of statutory and constitutional law. He had a laser-like focus on the key issues. The Chief was a wonderful writer. He didn’t like long sentences and unduly complicated writing. He always said that the job of an opinion was to state the ruling and to provide the support; it wasn’t to write a law review article or to announce some new multi-factor test that would only confuse lower courts. I’ve always tried to remember that simplicity is the best advocacy. I learned from the Chief to figure out the winning arguments and then to drive them home in the most common-sense way possible. LD: After your clerkships, you must have had some options in terms of where to seek employment. Why did you want to join Sullivan back in 1989? What about the firm has kept you there, and coming back, in an era where lateral moves have been common? RG: S&C is a special firm. I was attracted by the firm’s culture, clients and lawyers. We tend to work on the most challenging cases. We value teamwork. From my earliest days at the firm, I had great mentors, who gave me as much responsibility as I could handle. Most of the firm’s partners are lifers, and many of our clients have been with us for decades. Our model is simple and somewhat old-fashioned: to recruit the best lawyers, to train them internally, to provide the best client service, and to be commercial in trying to solve our client’s problems. LD: You also have served in a number of government capacities. What led to your interest in taking time away from private practice to take on such roles? Can you share how these experiences have benefited you in private practice? RG: If the job is right, working in the government can be wildly rewarding. I’ve worked in all three branches of the federal government. When I was in my early 20s, I worked in the Reagan White House. I drafted short speeches, briefing papers and letters. I met the President. I even saw Frank Sinatra rehearse before a state dinner. It was beyond exciting to walk into the White House every day. I don’t think there’s a better way to learn how to be a litigator than serving as a law clerk; I was fortunate to clerk for two of the best judges – Judge Ralph Winter of the Second Circuit and Chief Justice Rehnquist. Serving as Chief Counsel of the Senate Banking Committee involved everything from organizing hearings to supervising investigations to drafting legislation. I managed a big staff. I learned about the press and politics. It’s all served me well in representing our clients through courts, agencies and Congress in crisis situations. LD: The Private Securities Litigation Reform Act, or PSLRA, has served as the starting point for numerous debates in the area of securities litigation as well as the evolution of the law. Looking back as a drafter of the legislation, have your views on the level of its effectiveness changed over time? RG: The PSLRA was very balanced legislation that passed with strong bipartisan support. This law cleaned up some very serious abuses in the conduct of securities class actions – from plaintiffs’ lawyers who didn’t have real clients to companies settling meritless cases to avoid enormous litigation expense. Some opponents charged that the PSLRA would end securities class actions. Far from it. There have been more big settlements after the PSLRA than before this law. Because of the PSLRA, plaintiffs’ lawyers now have real institutional clients, courts can dismiss frivolous cases more easily, and it’s harder to sue companies whenever the stock price drops merely because executives made a bad decision or didn’t foresee some market disruption. LD: You’ve had a number high-profile case victories over the years, but it’s obviously preferable to stop a regulatory action or criminal matter before we in the media ever hear about it. What does it take to become good at convincing a government agency that your client should not be charged? People think of successful litigators being “tough as nails” or something similar – is there a more subtle skill at play during this earlier period when you have to “kill” a case before it starts in a public sense? LD: What do you envision yourself doing 10 or 15 years from now? Is there anything outside the law that you thought you might do at some point? RG: I may be doing what I’m doing now — litigating challenging cases for Sullivan & Cromwell clients. As I get older, that could change. Trying big cases is hard work; you need the right combination of energy and experience. Sometimes, I think I might like to become a judge. There are enormous rewards in public service, and lawyers have an obligation to give back. Time will tell. LD: What do you do to unwind or “stay sane” with such a heavy case load? RG: I spend most of my free time with my wife Joyce, and our three children —Elizabeth, 11, Caroline, 10, and Robert, 6. I try to stay balanced by exercising and eating right. I’ve been pretty addicted to golf since I was a boy. Golf is like litigation; it’s always challenging; it’s very tactical; there can be big and unexpected ups and downs; you have to stay calm under pressure; and the results aren’t always fair, but hard work usually pays off. There’s nothing like hitting a great golf shot or winning an argument in court.